The lucky number seven is considered auspicious by most cultures and demographics around the globe. People therefore directly or indirectly tend to correlate memorable dates, events and other important aspects of their lives with the number seven. If your lucky number is 7, then this slot game named Fruits N’ Sevens would surely win your heart. This online casino game is considered as a progressive jackpot where a player can accumulate enormous winnings through its various gaming features. Fruits N’ Sevens slots have been developed by Novomatic, a company which is hugely popular and is considered to be one of the best online casino developers. 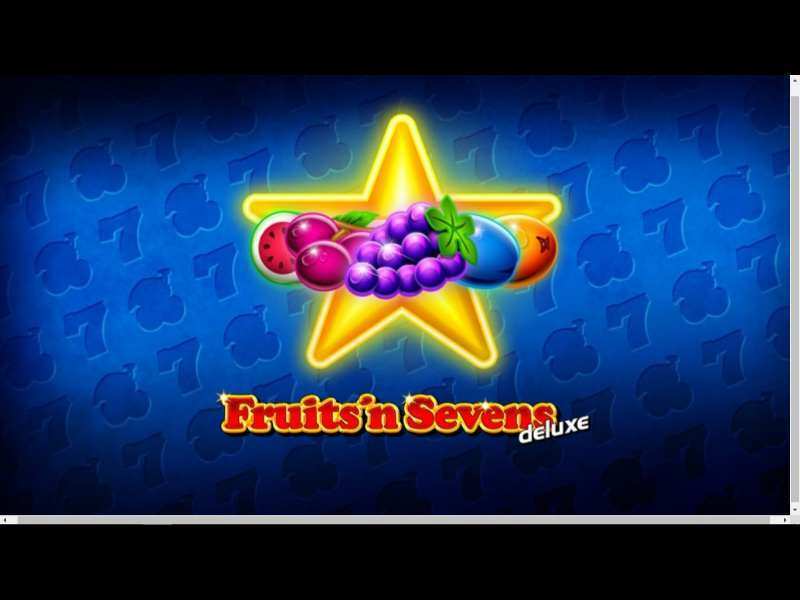 As the name clearly indicates about a fruit-based theme, this UK based slot game henceforth allows the gamers to enjoy the juicy fruits like oranges, lemons, melons, oranges, cherries, apples and plums as the thematic symbols in addition to the number 7 which is the highest valued symbol. The theme of the game is designed in a simplistic way which enables the player to keep the focus on the game rather than getting swayed into the animations, sound, and useless lighting effects. Every player can play free Fruits N’ Sevens casino slot machine since it doesn’t charge any real money while gambling. It provides the player to wager freely since it is a no download online slot game which absolutely requires no registration. Fruits N’ Sevens slots have 5 reels and only 5 pay lines to play for. There is a restriction in this online casino in the active pay lines since it’s non-adjustable. One can click on “Bet/Line” to set the size of the coins which range from 0.08 to 20. After selecting the coin size, the player can hit the “Start” button to let the reels to spin. If the player wants to get the reels to spin uninterrupted, there is an option of “Autoplay” which lets the player relax for a while. The slot machine to does the entire spinning process once the player selects the number of times the reels needed to be spun without stopping. This slot game doesn’t require the deposit of any amount to begin the game. The basic objective of this slot machine is to land three or more similar fruits on the pay lines which results in getting the rewards in the form of cash. If the player is able to land three or more either of cherries, lemons, oranges or plums, the player is rewarded with 720 coins if the betting amount is the lowest. 2000 coins are awarded if the kiwis or apples lands three times or more. The player receives 4000 coins if three or more melons land on the pay lines. At the maximum bet, the rewarding coins can be as huge as 650000 coins for the cherries, lemons, plums or oranges while the kiwis and apples can provide an enormous 1 million coins. At the minimum bet, melons were the top valued fruit symbols and so is the case at the highest bet which results in a win of 500 times its minimum bet reward i.e. 2 million coins. Even if the player is able to land the most valued symbol of this slot game i.e. number 7, the player is awarded 2 million coins. Fruits N’ Sevens online game has a feature of progressive jackpot wherein the player can be lucky if s/he lands a winning combination of all the 5 possible 7s in the pay line and there is a possibility to win a massive progressive jackpot of 10 million coins. The players also have an option to receive additional free spins depending on the gameplay. There are certain MG points which the player earns and as these points get accumulated and the desired number of such coins is reached, triggering of a bonus round namely Gamble Game occurs. The player can double the winnings and can successfully increase their coins. This online casino is really a lucrative slot game and a feature of progressive jackpot can augment the payout. The online slot has doesn’t have too many bonus rounds or similar extra features which usually let the players earn huge coins. However, the juicy symbols present in the slot machine let the players earn plenty coins depending on their betting amount. Fruits N’ Sevens might not be for those who love lots of bonus rounds but an amateur will surely love this slot game. Fruits N Sevens Online is not a conventional online slot game which has surplus features in it. This slot game is unique in its own way since it rewards its players massively through their symbols itself. The design has been kept very simple for the gamers to play and enjoy this wonderful slot game. 0 responses to "Fruits ‘n’ Sevens Slot"